We last went to the Nuremberg Toy Fair, Germany, in 2011, so the prospect of going this year was SO EXCITING!! I really was behaving like an over excited child and couldn’t wait until it was time to go……. As it was a bit of a treat as well as a business trip, we stayed in a really lovely hotel on the Market Square in the old town, which meant that we had easy access to all the beautiful streets and restaurants in the locality. Nuremberg is a really beautiful town and well worth a visit if you fancy a weekend getaway – especially at Christmas for the famous market. Getting to the fair was a breeze – just a quick journey on a train and we were there. Nuremberg is the biggest toy fair in Europe with 12 enormous halls filled with so many suppliers from around the world. There is even a bus that you can hop on and off that goes around the outside of the fair because the distances are so great. Dolls are concentrated in Hall 1, which is where we spent most of our time, but there were ‘must-see’ suppliers in halls 2 and 3 as well. Due to prior commitments we attended the fair on the last day, which turned out to be a really good move. I was concerned that we would miss most of the key people from our suppliers but this wasn’t the case at all. The fair was incredibly quiet which meant that the walkways were deserted so it was relaxing walking around instead of battling for floor space, and the stands were also empty. We therefore had all the time in the world to speak to suppliers and look at the products without anyone else wanting to do the same. Because Petalina has been going for nearly 10 years I have built up relationships with so many different suppliers by email and phone, but this was our chance to meet everyone face to face. It was lovely! Anyway, enough of the chit chat I hear you say. What did you see? Gotz – our favourite stand of course showing all their wonderful range of dolls, dolls clothes and accessories. Marie is going to be ‘the doll’ for children this year I think, with Charlotte and Cara favourites with collectors too. Can’t wait for all the dolls to arrive! We were really pleased to meet up with Corolle because we are now ordering directly from them again, which means that we have access to the whole range. The most notable change to the range is the introduction of Ma Corolle, a range of dolls with bodies made to look like underwear with absolutely tons of separates and accessories available to dress them up in and bring them to life. These will be in stock very soon. We also loved a new 30cm baby for 18 months which laughs, coos and gives kisses. Very sweet! Antonio Juan – the range is better than ever. Lots of beautiful toddler and baby dolls dressed in clothes made from natural fibres in pastel colours. Our customers love the realistic faces and sparkling eyes. Their new catalogue is due to arrive in about a month’s time so I’m unable to let you have more details of the range and prices until then. As usual Llorens still have a range of gorgeous toddler dolls with all vinyl new born babies. New this year is a soft bodied baby with vinyl legs that are jointed and move easily, so the best of both worlds – cuddly and posable, as well as pretty! I felt that the Paola Reina collection was very strong this year because I think the outfits will appeal more to the UK market more than in the past. The ranges of their dolls are the same with my favourite being this Soy Tu girl with red hair. They did however launch a new range of ‘Gorjuss’ dolls by Santoro which they have been working on for the last few months. Many of you will have seen cards, stationery and accessories from this lovely range in the shops, all featuring the Gorjuss doll. Paola Reina have made an incredible of job of creating a vinyl doll that represents the dolls perfectly. They are made using very soft flexible vinyl with rooted hair that looks like a wig and the most divine clothes made using beautiful fabrics. Stunning. Oops – forgot to take a picture of these! Kathe Kruse – this year sees a simplification of the Kathe Kruse range of dolls compared to last year when, to be honest, there were so many new ranges being tested that it was really difficult to choose. If you remember Kathe Kruse is now part of the Hape group and this takeover allowed some experimentation to try out new ideas. So this year the business has kept all the strongest elements of the range. Mini Minouche are beautiful once again but I notice that they are now for children from age 3 and not 18 months which I think is a mistake. Mini Bambinas see the addition of a new doll with a new face and more compact body and these dolls are for 18 months +. I wonder if the intention is that this new doll takes the place of the mini Minouche. Very sad is that Bambina has gone completely and I am devastated because this doll is the most similar to the dolls Kathe Kruse made when she began her company over 100 years ago and Petalina sells them very well. The Cool Girls are now the Girls and their outfits are simpler and more traditional which I think is a good move, but there are very few of them. There are still bath babies, Sweet Girls, gorgeous clothes and shoes and of course the popular Lolle doll in lots of colour options. Kathe Kruse remains the Rolls Royce of the doll world and they maintain a quality standard that other doll manufacturers must aspire to achieve. Until you have held one in your hands it is difficult to imagine this, but the quality is very evident. Kidz ‘n’ Cats are now a sister company of Kathe Kruse as they too are part of the Hape Group. I totally understand the reason behind this because the Hartmanns have been running a small business, which I know from experience is really hard work, so instead of being able to concentrate on designing dolls, Sonja has been involved in all elements of running the business including dressing hundreds of dolls and shipping out orders. Gesa too is now released from much of the day to day admin and can concentrate on looking after all the Kidz ‘n’ Cats retailers. Being part of a much larger business also gives Kidz ‘n’ Cats more buying power. Sonja was so thrilled to have the backing and support of Hape which has resulted in the furniture finally being put into production, and also changes to the production of the dolls which you are all going to very much approve of. The new dolls for 2016 were all on show and looked just as wonderful as in the catalogue, and all are on the website to see. It was great to meet up with WeGirls and hear their plans for the growth of the ranges. The dolls really are very beautiful and look great all dressed up to have fun. If you have been considering a purchase of a WeGirls doll then I would encourage you to do so because their happiness is infectious! Our Generation and the new range of Lori dolls were at the Toy Fair in abundance and were shown by their makers Battat Ltd, rather than any of the distributors. The stand was huge with a roof so that retailers could imagine the possibilities of creating an Our Generation haven for little girls within their own stores. There is no doubt that the range is phenomenal and is going to continue to take Europe by storm. 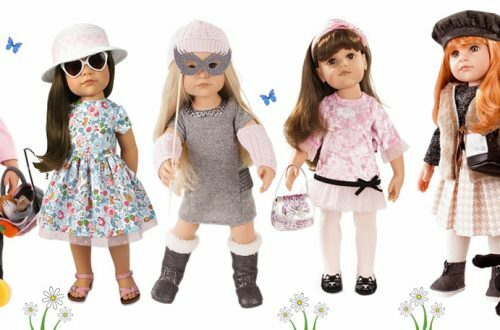 The dolls are such great value that they make a perfect first dabble in the 18” doll market, but their accessories suit lots of different brands of doll, and no other brand has as much choice. Petitcollin had an amazing year last year with help from Sylvia Natterer and her line of Finouche and Minouche dolls. Made in Spain, the dolls sold very well to both collectors and children and as a result the range of both dolls has extended this year. 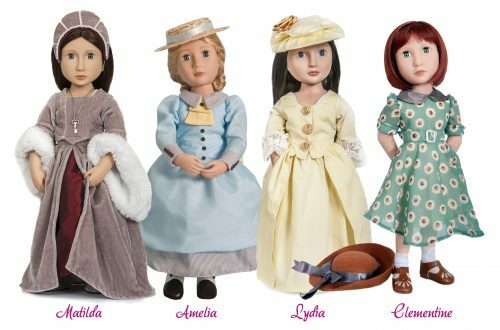 Not only that, Sylvia has designed two more ranges of dolls for Petitcollin. There is a range of 44cm all vinyl child dolls called Starlette. These girls have a new face mould with detailed eye painting including eyelashes which give a very pretty effect and remind me of Sasha dolls more than ever! And then there are the Bibichou baby dolls, 35cm all vinyl babies with full articulation dressed in beautiful pastel coloured clothes. The babies arrive with a bed (their box) and bedding, which is lovely. I will put together a separate blog post of all the new dolls shortly. Schildkrot dolls are such good quality, and their range keeps going from strength to strength. One of our most popular dolls is a 52cm old fashioned baby from a range called Julchen and this year there are two new baby dolls that our customers are going to love. Last year was also the first time we sold a range of prams by a new company from Spain called DeCuevas. The prams caught the imagination of the British public and the company ran out incredibly quickly, but not all of our customers were pleased with the quality. This year DeCuevas have improved the finish of one of the prams and produced a really high quality pram with lovely fabrics, lining and bedding, and this is the one that we will stock at Petalina because it is stunning. We had a fantastic day out seeing all the new ranges and meeting suppliers but there was just one disappointment. This time there were no surprises. We didn’t stumble upon a range that we knew nothing about that was a ‘must have’ for Petalina, which is one of the reasons why it is worth making a trip to the Toy Fair. But on balance, it was a superb trip that was very worthwhile taking. We had a ball!